Artists possess the creative power to portray a simple bird — say a male mallard duck — in a multitude of ways, something I never really appreciated until I reviewed hundreds of duck portraits in the Federal Duck Stamp Contest. Judges in the annual contest seem to prefer a super-realistic style. Each year, the winning entry is used to create a federal duck stamp, which are the stamps that waterfowl hunters must carry while hunting. They are also purchased by many people who care about conservation. Details in the duck portraits are important, but it is also interesting to observe the landscapes that the artists place in the backgrounds and foregrounds of their pictures. Take a look at the Flickr page where 215 entries are shown in the latest contest sponsored by the U.S. Fish and Wildlife Service. Eligible species for this year’s contest were the mallard, gadwall, cinnamon teal, blue-winged teal and harlequin duck. The winning entry for this year’s duck stamp was submitted by Bob Hautman of Delano, Minn., whose acrylic painting shows a pair of mallards in flight. This is Bob’s third winning entry, after two previous paintings were turned into stamps in 1997 and 2001. Hautman comes from an artist family. His brothers, Jim and Joe, have each won the same contest five times. 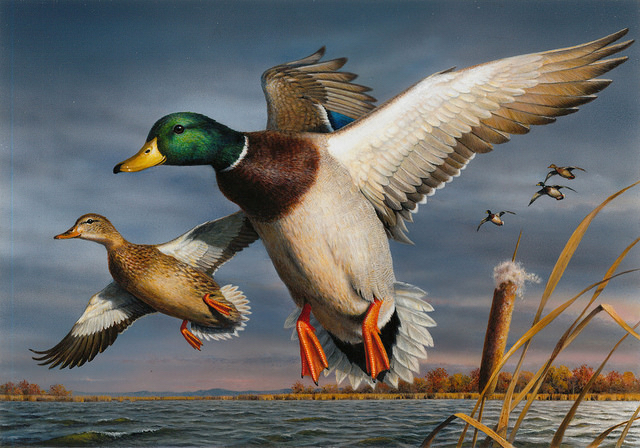 The Federal Duck Stamp, which will go on sale later this month, sells for $25. Proceeds, which total about $40 million a year, go for protecting wetland habitats in national wildlife refuges across the country. 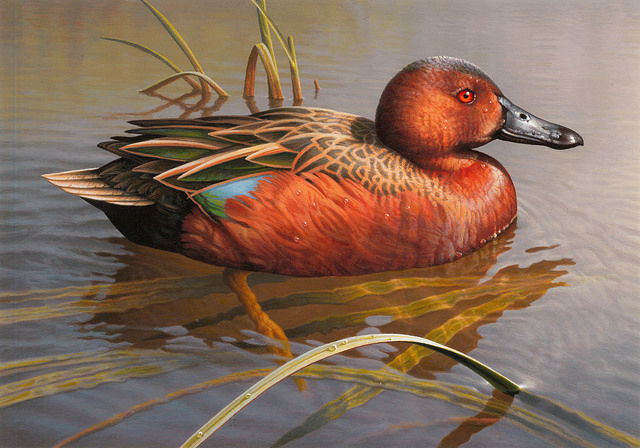 Second place was an acrylic painting of a cinnamon teal by Greg Alexander of Ashland, Wis., and third place was an oil painting of a blue-winged teal by Christine Clayton of Sidney, Ohio. 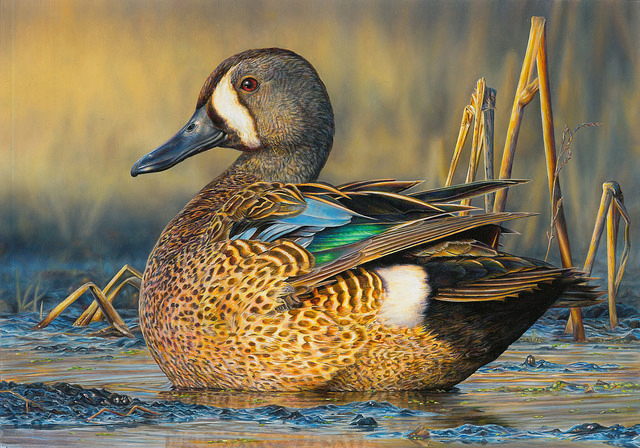 By the way, Christine was the third-place winner of the National Junior Duck Stamp Art Contest in 2000, when at age 17 she entered a painting of a northern pintail. 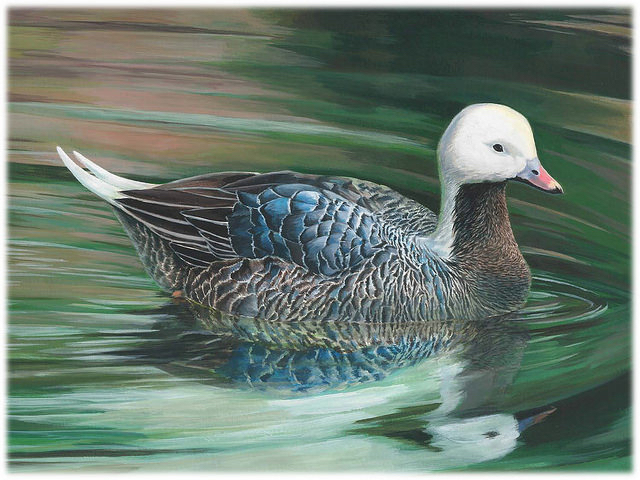 The winner of this year’s junior contest is Rayen Kang of Johns Creek, Ga., who submitted an acrylic painting of an emperor goose. Second place went to Daniel Billings, 17, of Gallatin, Mo., who painted a redhead in oil. Third place went to Larissa Weber, 17, of Anderson, Ind., who painted trumpeter swans in acrylic. The Federal Junior Duck Stamp Conservation and Design Program encourages students from kindergarten through high school to explore their natural world, learning about biology and wildlife management. A $5 Junior Duck Stamp is purchased by collectors, with revenue going to support environmental education.